As the season 2 of Empire is in full swing, the FOX has unveiled the trailer for the Empire Season 2 of Episode 17, titled Rise by Sin. In the next chapter, Lucious and Cookie will travel together to the American Sound Awards. Cookie does everything to gather the family and defuse tensions, but they reappear more and more regularly. Conflicts between Lucious and children continue to grow. 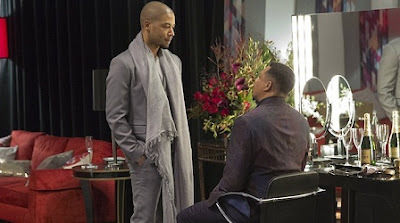 We see in the trailer Lucious consider hitting Jamal, by issuing harsh words. The story that will play on the morale of Cookie who tends to be blinded by her love for Lucious. During the ceremony of American Sound Awards, a shot rang out and the trailer announced that Lyon "will fall." The outcome of the season 2 could be dramatic for the Lyon family, as suggested by the synopsis of episode 17. The series confirms its performance remain the most watched program on Wednesday night across the Atlantic. Fans will remember that P. Henson Taraji won the Golden Globe in 2016 for " Best Actress in a Drama Series ". The actress was honored the production and emphasized the originality of the TV Show with Entertainment Weekly. "Throughout my career I was told 'Black shows are not popular abroad, we cannot do that. ' and many Cookie arrived and everyone fell in love with her! People see actors talents they see talented scripts. Again, thank Dana and Gary for believing in this project and to have seen a coming change was necessary. Something needed to shake television. She is too conservative and that's not the real world. Look around you! "